This thread is dedicated exclusively for those students currently enrolled in InterNACHI’s free, online How to Inspect Lawn Irrigation Systems Inspection Course. Upon successful completion of this course, you shall be able to inspect the basic components of an irrigation system, including an atmospheric vacuum breaker, irrigation clock, zone coverage, head direction, pressure buildup, and more. Follow the instructor as he performs an inspection of the different components of an irrigation system at a residential location. 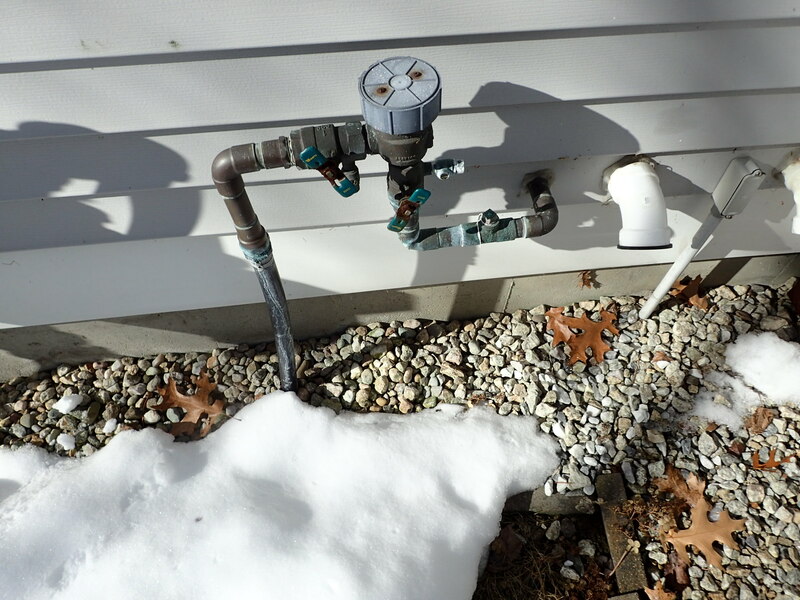 Irrigation systems in New England are usually winterized by shutting off the water and blowing the lines out with a compressor. 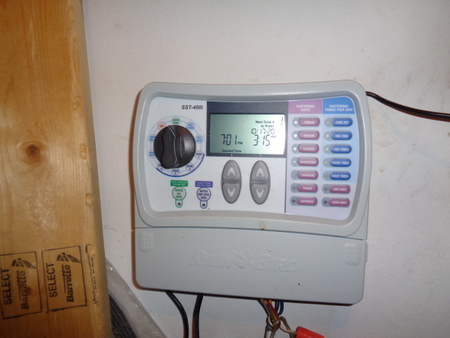 If the systems are not properly winterized they are subject to freeze damage. The valves on the vacuum breaker have been left in the half open position (as recommended by the manufacturer)to minimize the risk of damage from freezing after being winterized. Essay assignment for how to inspect lawn irrigation systems. I chose the basic irrigation system image from Internachi’s image gallery as my subject. 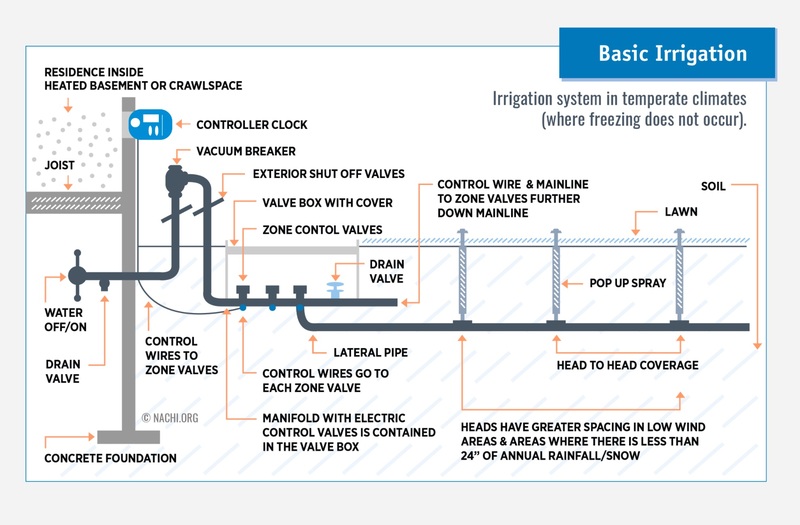 This graphic illustrates the basic components of an irrigation system which may assist an inspector in explaining the system to a client. 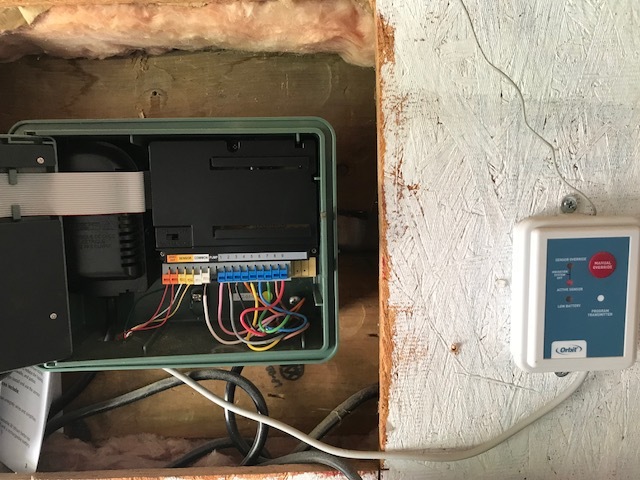 While irrigation systems are outside of the scope of a home inspection (in New Hampshire), I have found that my clients take a keen interest in whether or not the irrigation system is in serviceable condition. As these systems can cost several thousand dollars to install, I have to agree with my clients. After taking a close look of this sprinkler irrigation system, it is easy to see that it was installed recently. All materials are free of rust, cracks, apparent leaks or rot. 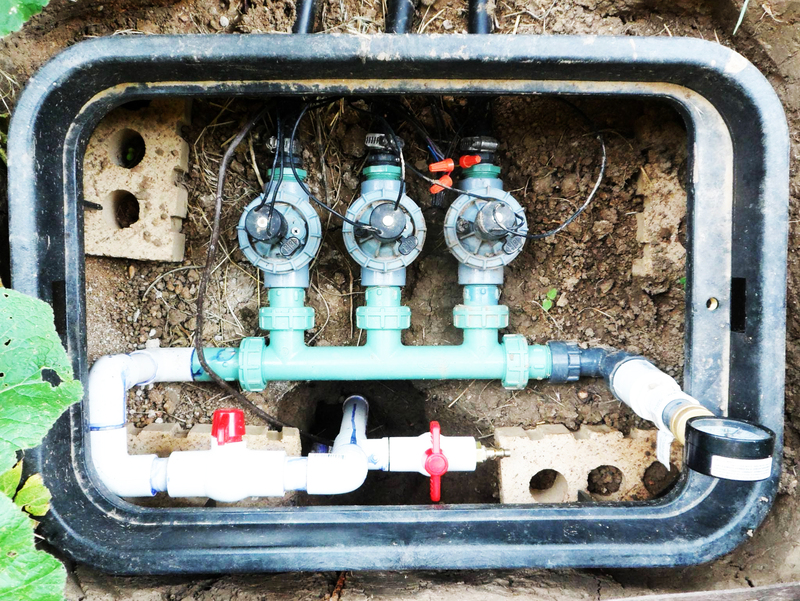 It is also notable that a proper manifold was installed for three irrigation zones. In better installed systems we may find an extra one in anticipation of the growing needs of the homeowner. It was very nice to see that although we are in a no-freeze zone, they have installed a purging valve as well as an emergency shut off valve. The wires are in excellent condition and are of proper gauge for the voltage needed to operate properly. The silicone applied to the connections of every wire makes it apparent that the installer took extra precautions to prevent shorts. Lawn sprinklers, although very helpful in water conservation and property maintenance schedules may also contribute to water damage to structures if they aren’t aimed or calibrated properly. It is important to aim water sprinkler distribution in directions radiating away from wooden build structures or at the very least install extra protection to the structures it may affect. For example: a deck post that daily gets wet from a sprinkler could benefit from a vinyl cover to protect it from the excess moisture and allow it to dry properly to prevent moisture damage over time. HEIGHT AND COVERAGE: The Orbit 4 Adjustable Spring-Loaded Pop-Up Lawn Sprinkler Heads are designed to raise high enough to clear obstacles ensuring excellent water coverage! DISTANCE: No more wasting water and soaking the sidewalk! This Orbit sprinkler will reach distances of up to 15 feet! 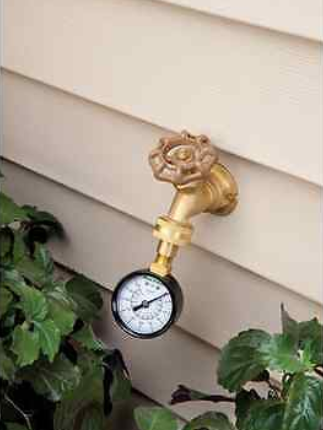 Big or small, simply adjust the sprinkler head to fit your lawn size! The Rainbird sprinkler control clock operating this sprinkler system was found to be operational. Despite being operational, this unit is outdated and it is recommended that this unit be replaced in order to take advantage of the more efficient systems available today. It is very important to continually monitor your sprinkler heads to ensure they are watering the lawn/plants you intend them to water. Often times, vehicles, lawn mowers or regular foot traffic can knock these heads out of adjustment. 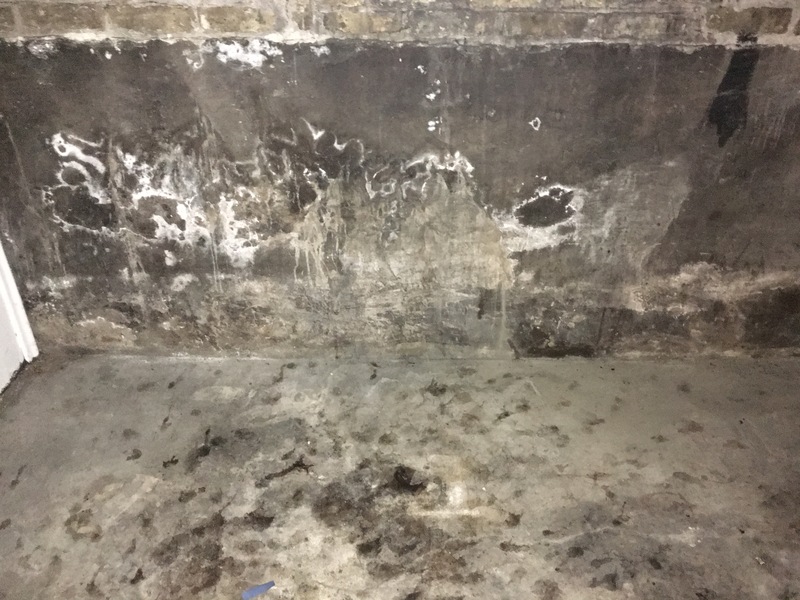 As a result, heads can spray water on wood surfaces creating an accelerated wood rot situation. 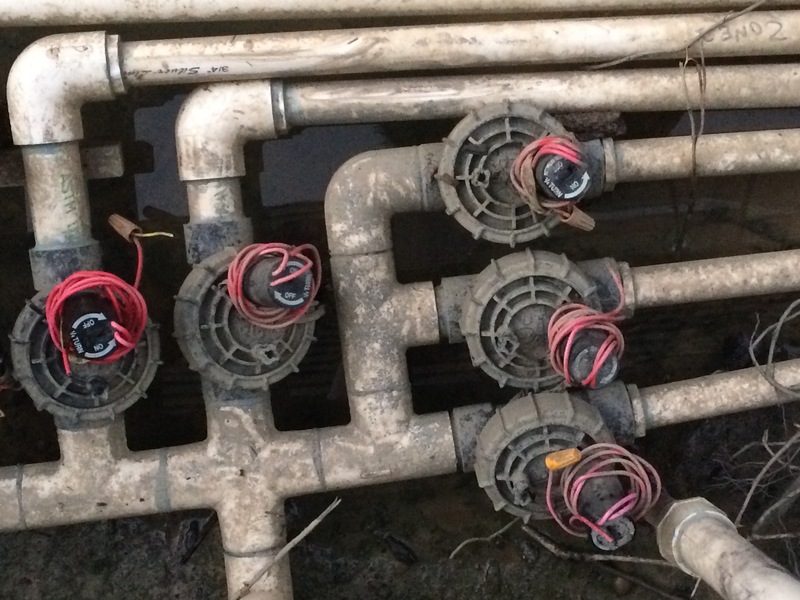 This is a picture of the sprinkler manifold system and valve assemblies from my house when I moved in. The previous owner had a leak in the back-flow preventer and decide to cut out the control panel (clock per the video) and scrap the system. Not knowing the actual condition of the system, I decided to tear it out and replace the manifold system, valves and control panel. With the system running, I was able to find several issues similar to those in the video’s and have corrected them. It was a great learning experience and by taking the course afterwords, I was able to thoroughly understand everything he was talking about. I read the article “The Small House Movement”. In my opinion, these tiny 100 sqft or less houses are nothing more than a covered trailer used by people trying to get attention. I understand that they would be good for travelling around, but so is a camper or tent. Living in less than 100 sqft for any length of time is not practical and, in my opinion, stupid. The irrigation system is composed of the vacuum valve or the double check valve followed by the manifold that distributes water to the different zone valves. Zone valves can be electric with a solenoid that operates the on/off of the valve which is controlled by the control clock. 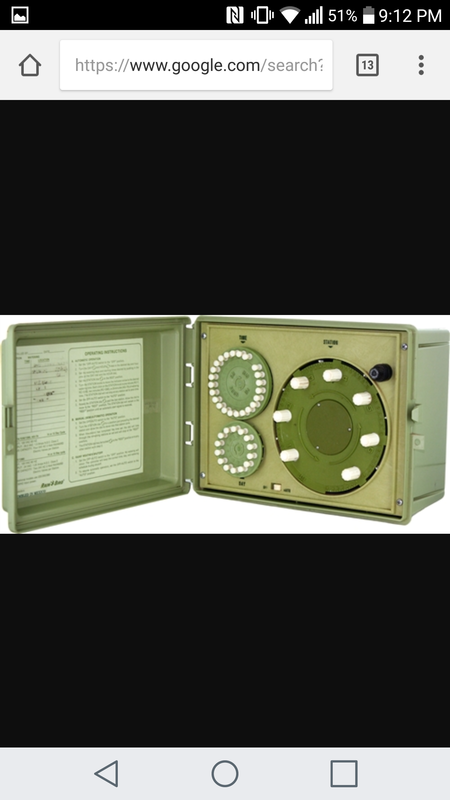 This is an Orbit 9 zone irrigation Clock. As the picture indicates, there are 9 zones completed in this system, all separated by color, which indicates each valve that it controls. The white wire is the common wire. That is the only wire that is attached from the clock and then to each valve. This system is also equipped with a wireless rain sensor that will deactivate the system when it reaches its preset amount of moisture. I chose to study the Fire Safety for the Home article. As a professional firefighter, these simple but key ideas for the general public are a fantastic reminder for fire safety steps. There are a few things Id like to add based on my 17 years in the fire service. First, regarding smoke alarms. Not only should each home in America have the proper working amount of alarms, but don’t choose the cheapest one just because they seem expensive, they wont seem that way when your life is in danger. Kidde was referenced in this article as the leading manufacture for fire safety items, and they offer a wireless battery powered alarm that works the same as the hardwired-interconnected models. These are highly recommended if your home is not wired for alarms, and they work very well. Second, #5 referenced smoking in the home. NEVER smoke in the home, no matter how cold or nasty it is outside. There is one other thing though, if you choose to smoke outside, where are you dispensing the cigarette butts? Often times these are just as carelessly left in an area that is a combustible as if you were to leave it inside. Many house fires start on the outside of the house and cause significant damage because of improperly extinguished cigarettes. This also leads into where you place your campfire ashes. In the past 3 years I have been on more fires started because the home owner tossed the ashes into the trash can thinking they were cool enough. Most of the time they are not, even the next morning. Douse them with water or wait another day if you are going to dispose of them in the trash container. This Rain Bird controller clock is the brains of the system. It sends the zone valves current that opens an closes the valve that allows water to flow to the irrigation sprinkler heads. It also determines the days and length of watering. One cause of exterior wood rot on siding can be traced to irrigation system sprinkler heads that are not directed properly allowing water to penetrate wood siding. Check sprinkler range monthly to ensure proper water coverage and sprinkler head condition. This essay is to comply with the online course Lawn Irrigation Systems Inspection Course. I chose this photo for the inspection and writing assignment because it applies to a common irrigation problem in Florida. Irrigation systems on new construction are often installed before the sod is put down. 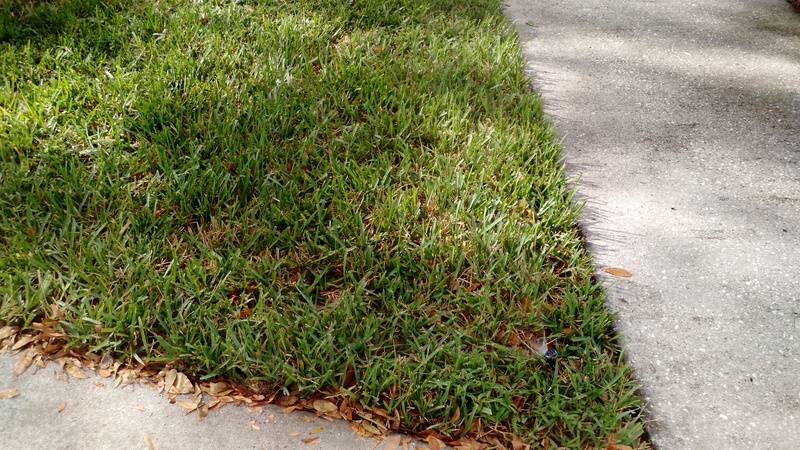 Most of the homes in South Florida use St Augustine grass. This type of grass grows on top of the ground, with the roots on top of the ground as well. It gets tall quickly and outgrows the height of the sprinkler heads. Most homes we inspect that are 4-10 years old has this problem of the sprinkler heads not being tall enough for adequate coverage. The article that I chose to read in order to comply with the online course Lawn Irrigation Systems Inspection Course was Wildfire Mitigation Strategies and Inspection by Nick Gromicko . I chose this course thinking it would tie into sprinkler systems as some point as a tool to keep the area around the home more fireproof and green. Elimination of any of the three things needed for a fire is a good tool for fire prevention. The fire triangle (things needed to have fire) is Fuel, Heat, and Oxygen. Sprinklers can keep the area around a home green and less fire prone. Potentially (if the flame height, rate of spread, and weather conditions are low) a sprinkler system could stop the fire from getting to a home. This is a picture of a Rain Bird water pressure test gauge. Simply screw this on to a hose bib and turn on the water. This is used to check water pressure when determining the irrigation setup. It will confirm whether or not the home has enough water pressure to have a functioning irrigation system. It will also tell the installers how many heads can run off of 1 zone, how much reducing is needed for other zones, etc.